To Appease Tea Party, Boehner Adds Balanced-Budget Amendment To Bill : The Two-Way The addition to the House speaker's budget bill is likely to cement Democratic opposition further, but may provide Boehner enough Republican support to try for a vote today. 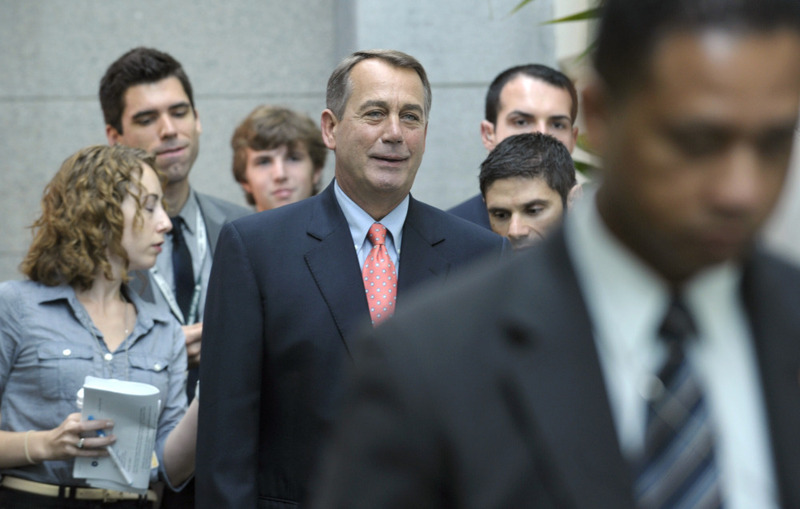 House Speaker John Boehner of Ohio walks to a caucus meeting on Capitol Hill in Washington. As we reported earlier, President Obama dismissed House Speaker John Boehner's (R-OH) plan to raise the debt ceiling. In a news conference, he said the bill "has no chance of becoming law." Now, multiple news outlets are reporting that Boehner, in an attempt to woo Tea Party Republican votes in the House, added a balanced-budget amendment provision to his budget plan. That means two things: First, it gives Democrats more reason to dismiss the bill, as they overwhelmingly disapproved a similar measure that was included in the doomed "Cut, Cap and Balance" bill that was passed by the House, last week. However, it seems like the change could get Boehner enough votes to pass the bill through the chamber. Remember, Boehner could not gather enough Republican votes yesterday and had to yank the bill off the floor. Republican lawmakers say the Boehner framework would still pave the way for the debt limit to be raised through the 2012 election in two chunks. But it would also mandate that the second hike of the ceiling could only occur after a balanced-budget amendment passed both chambers of Congress and went to the states for ratification. The House had scheduled votes on two BBAs for this week. Under the revised Boehner plan, the sending of either to the states, including a version that attracted significant Democratic support in the mid-1990s, would allow for the second debt-ceiling increase. Rep. Jeff flake (r-ariz) said the balanced budget provision has flipped his vote, and he predicted it will help bring many other members onto the bill. "Let's go vote 100 percent for this bill," Georgia Rep. Phil Gingrey, one of the last holdouts, urged his colleagues, according to a source inside a closed-door House GOP conference meeting. "That's the difference" Rep. Vern Buchanan (R-Fla.) said, predicting the provision will secure the bill's package. In a press conference, Senate Majority Leader Harry Reid (D-NV) said that he has Democrats on his caucus who want a balanced budget amendment to the Constitution. He said he doesn't mind Republicans putting it up for a vote, but he said the amended bill as it looks now "wants a gurantee that it passes before" raising the debt limit. He said that shows this a group of people "driven by ideology" and "unwilling to compromise anything." Reid said it shows a kind of "extremism." At this point it looks like the House will take a vote some time in the next few hours. A big indicator that things are looking for the bill potential to make it through the House is that Club for Growth, an influential fiscal-conservative group, is now OK with Boehner's plan. The group had asked conservatives to vote against the plan, previously.